Heather Warren describes Harm as a skeleton, a fundamental framework laid out by band founder Rebecca Menzia. And to that skeleton, Menzia, Warren and their bandmates add layers — the nerves, sinewy muscle and skin — to animate and amplify the body. The result is Harm's signature sound — a moody, stirring blend of folk, psychedelia, hip-hop and chamber music steered by haunting harmonies. "Rebecca brought to us a foundation, a skeletal composition that we all filled our parts into organically," Warren said. "I would give her poems I wrote and she captured the tone and essence perfectly. Molly (McDermott), Matt (Roberts), and Laila (O'Sullivan) are so talented in their ability to add more layered texture." 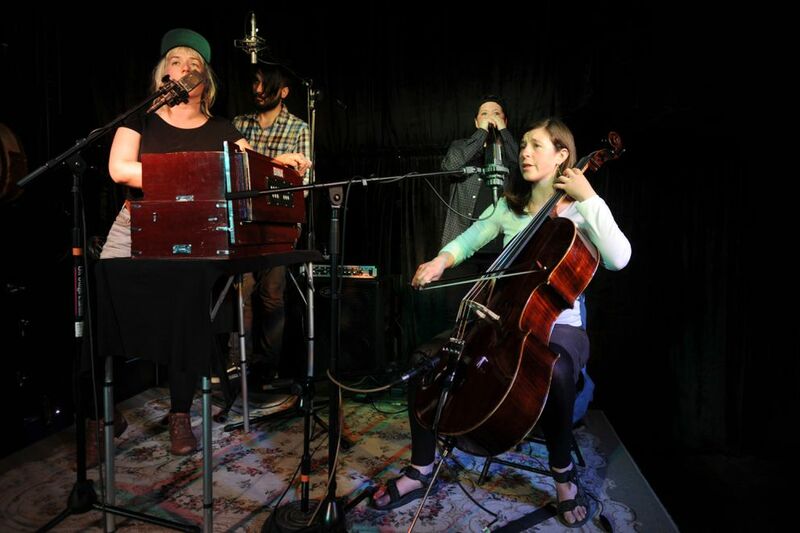 Menzia founded the band in Fairbanks in fall 2014, bringing together an eclectic group of musicians who she thought, despite seeming somewhat irregular, would fit together. "I was ready to begin cultivating my original music in a collective setting," Menzia said. "I had been playing in a few bands in Fairbanks and producing some solo music on the side, but I wanted to start prioritizing my own compositions. I handpicked the members after careful deliberation. Some were people I had worked with before and others I barely knew. The band immediately fulfilled my vision, and I have had such a wonderful time working with all current and past members of Harm." The band garnered some early buzz within the state and became the torchbearer for the Fairbanks independent music scene. "It is very tight-knit," said cellist McDermott. "Everyone knows everyone else, but there is still a lot of diversity and talent. Fairbanks is big enough to have folk, metal, punk and jazz scenes, but they cross over in a way I haven't seen in larger cities. The winters are dark and long, which give a lot of opportunity to practice." With four women in the group, Harm has also worked to provide opportunities for other female artists. 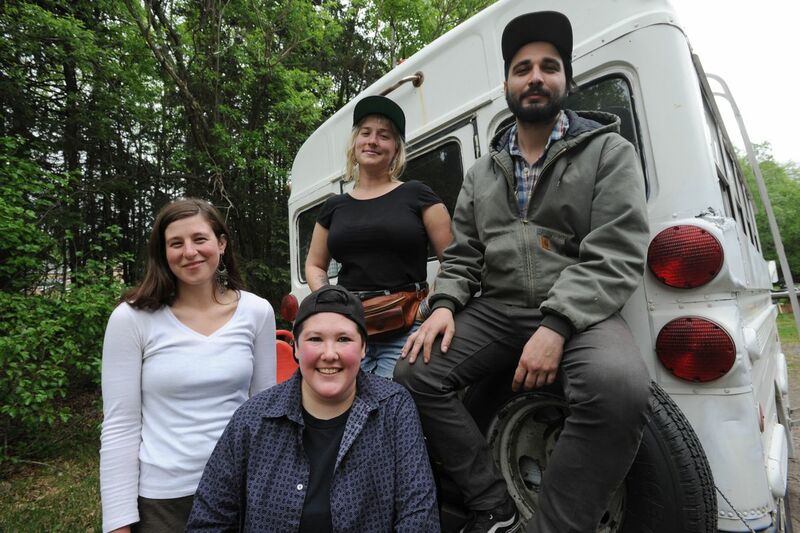 "I have made a personal effort to lift up the female music community in Fairbanks," Menzia said. "I have thrown a female-centered music festival three years in a row, and am currently planning the fourth annual festival (Babefest) for this fall." After producing some videos of their music, Harm also did some touring in the Lower 48. Menzia earned a Rasmuson Foundation grant in 2016 for a Harm recording project. With the grant secured, Menzia and Harm proceeded to find a studio that would fit their aesthetic. "There's an album I adore called 'Jula' by Spirits of the Red City," Menzia said. "While choosing a studio I was conceptualizing the album as a holistic creation more than a collection of individual songs/poems — I thought of 'Jula' and researched the studio where it was recorded. La La Land in Louisville, Kentucky, felt perfect immediately." The resulting album, "Mother Carries," recorded in January, is quintessential Harm — plush, mysterious and unpredictable. It features Menzia on vocals and harmonium, with Warren providing lyrics and beatboxing. McDermott (vocals, cello), O'Sullivan (vocals, clarinet) and Matt Roberts (synth, metallic percussion) round out the performances. "The recording process involved full days where we were often recording or listening to the tracks 10-12 hours each day," Warren said. "Kevin Ratterman and Anne Gauthier (from the studio) were so patient and encouraging. We really appreciate their laid-back approach and their guidance all while allowing us to maintain control over the direction of our sound." Menzia said having Gauthier as a female presence in the recording process was especially reassuring. "Recording is a very vulnerable experience," Menzia said. "Capturing the beauty and nuance of your art also means putting your weaknesses under a microscope. It was a really valuable learning experience for everyone to face the flaws in our music — there were harmonies and arrangements we had been playing for years that didn't have the structural integrity we had intended, and thus needed to be re-written in the recording process." Along with the album, Harm produced a video for the song, "When We Are Unseen." The collaboration with director Emma Sheffer had been in the works since she saw the band at their first Anchorage performance in spring 2015. "Harm's music has such a strong emotional narrative that when it really came down to making a video, simplicity made the most sense," Sheffer said. "I didn't want anything to distract from the song. We aimed to create visuals that supported song while letting it speak for itself. "The dancers (in the video) are each moving to the piece in their own time — one is dancing in slow motion, one in reverse and two in 'real' time, matching and interacting with each other at moments while maintaining independence. Hopefully, this allows space for the viewer to listen to the song in different ways from different perspectives." But just as the group seems to have reached a creative apex, it's entirely possible that the band members will part ways, with the album operating as a virtual final act. "The band is organically winding down," Menzia said. "I just accepted a teaching job in the Mat-Su Valley, and Molly was accepted into a Ph.D. program in Boulder (Colorado). We both leave Fairbanks in August. I am not saying we will never play another show, but this album brings a sense of finality to three years of artistic growth for all of us and leaves a natural pause for everyone to begin cultivating new projects."